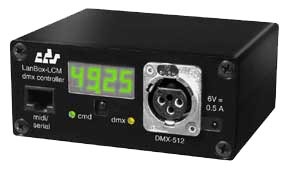 The LanBox-LCM is a mini version of the LanBox-LCX DMX controller, made to run stand-alone or controlled via MIDI or serial. It's very small, very low priced and very easy to use, yet it supports 512 DMX channels and has the same command set as the LCX. With an of the shelf IR VCR remote controller (not included) you can also select pre-made light scenes, chases or light channels. The four-digit LED display provides simple feedback. Bundled software includes LCedit+ a graphical lighting editor for MacOS, Mac OS X and Windows 98SE/2000/XP. Purchase using Visa / MasterCard with our secure payment system or using PayPal with the Buy Now buttons to the right. For COD orders or payment by check, e-mail us at sales@midilite.com. maximum 1024 active light channels. Hundreds of cues, divided into a maximum of 999 cue lists with up to 99 cue steps. (The actual maximum number of cues depends on the number of channels used in a cue). LC+ firmware & LCedit+ cue editing software (MacOS 8/9, Mac OS X, Win98SE/2000). 3-pole XLR female DMX output connector. RJ45 connector for a serial, modem or MIDI and two switch inputs connections. 5 pole din connectors on MIDI adapter. DB9F RS232 connecter serial adapter. for editing or cue triggers via serial or modem connection. MIDI, for editing and cue triggers. Two external digital (switch) inputs for external cue triggers. Program change translation to select scene (cue list) command.